Status: Locally common regular resident central and east, rare Panhandle. Uncommon casual winter visitor east of breeding range. Documentation: Specimen: UNSM ZM10301, 25 Nov 1912 Comstock, Custer Co.
Taxonomy: Three subspecies are recognized (Pyle 2008): cupido, the extinct Heath Hen, attwateri, surviving in coastal Texas only with extensive conservation efforts, and pinnatus, the subspecies occurring in Nebraska and the northern Great Plains and Midwest. 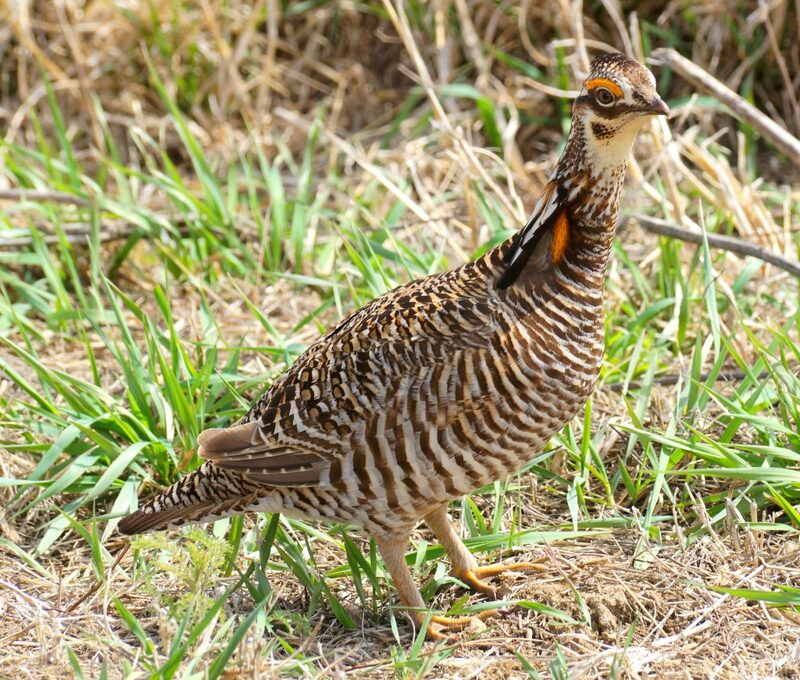 Some authors (Johnsgard 1979; Sibley and Monroe 1990) have considered this species and Lesser Prairie-Chicken (T. pallidicinctus) conspecific. See Sharp-tailed Grouse for discussion of hybrids with that species. Changes since 2000: Population increases and range expansion observed in southeast Nebraska in the late 1990s and early 2000s, apparently in response to increased land set aside in the Conservation Reserve Program (CRP; Rodgers and Hoffman 2005, Scott Taylor, NGPC, personal communication) tended to be reversed as grain commodity prices subsequently increased and CRP land returned to row-crop agriculture (Jeffrey Lusk, NGPC personal communication). Population increases in southeast Nebraska and elsewhere possibly led to some range expansion, such as in the Rainwater Basin, where small numbers were observed at and around grassland tracts associated with wetland conservation properties. Reduced vertical structure such as trees and farmsteads in the landscape concomitant with agricultural intensification may also have benefitted the species (Jorgensen 2012). Resident: Highest densities occur in north-central Nebraska, especially eastern portions of the Sandhills, and decline to the east, south and west where the range becomes discontinuous. Isolated portions of the species’ range are generally associated with landscapes of grassland located within regions of intensive row-crop agriculture. Despite reduction in CRP acres and grassland, Greater Prairie-Chicken numbers appear to be stable or increasing. BBS trend analysis shows an annual increase of 6.79% (95% C.I. ; 2.36, 11.45) during the years 1966-2015 (Sauer et al 2017). In the Panhandle, Greater Prairie-Chicken appears to be expanding westward in recent years, although it may occur with some regularity only in extreme eastern Sheridan Co. 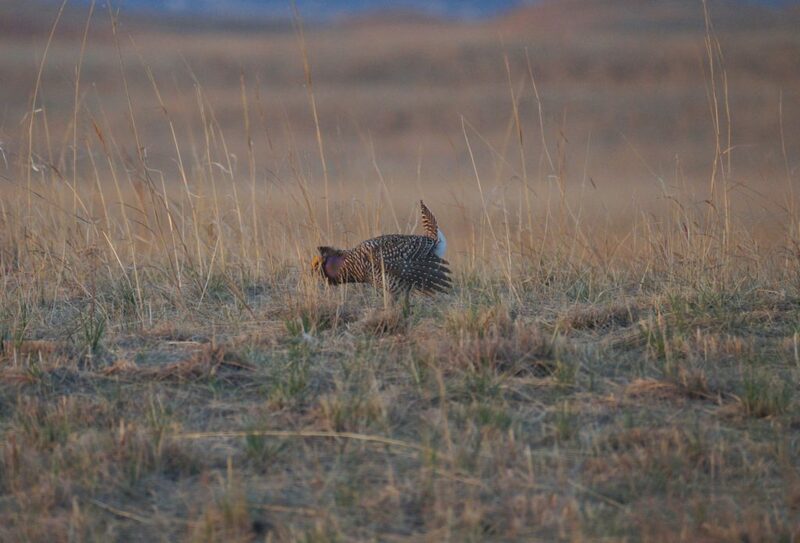 Recent reports from Sheridan Co are of three at Smith Lake WMA 10 Aug 2006, one on a Sharp-tailed Grouse lek in southeast Sheridan Co 20 Apr 2016, three about 20 miles south of Gordon 7 Jun 2016, one at Walgren Lake 20 May 2018, and two “Possible” breeding reports from central Sheridan Co (Mollhoff 2016). In Garden Co, recent reports are 11 Jun 1991, two “Possible” breeding reports (Mollhoff 2016), one flushed at Crescent Lake NWR 24 Apr 2017, and “distant booming” heard there 4 Jun 2018. The only other Panhandle reports are of two in Cheyenne Co 12 Apr 2011, one in Deuel Co 20 May 2016, and single “Possible” and “Probable” reports from northeastern Morrill Co (Mollhoff 2016). In northeast Nebraska, small numbers occur as far east as Buckskin Hills WMA, Dixon Co, where at least two leks have been active since at least 2003; peak count there is 24 in 2009. In Cedar Co, 1-2 were seen at Obert and near Laurel 23 Mar-12 Apr 2003. The range also extends eastward into southwest Antelope Co and extreme northwest Boone Co, where 254 were tallied 29 Dec 2019 (Jason Thiele, personal communication). Further south, small numbers occur in an area of sand hills southeast of Genoa, Nance Co; one was seen in extreme southwest Platte Co 20 May 2007 and 1-3 were booming in Platte Co 4-11 Jun 2009. South of the Platte River this species occurs east to Adams and Webster Cos, but east of there its habitat is localized, and distribution is discontinuous. There are no reports for Gosper Co, but two were booming in Furnas Co 5 May 2009. Further east, there are reports from isolated Sandhills remnants, such as south of Atlanta in Harlan Co, and two miles west of Holstein and southeast and southwest of Lowell in Kearney Co. This area is just north of the species’ north-central Kansas range, which is separate from the well-known Flint Hills population (Busby and Zimmerman 2001). Jorgensen (2012) presented evidence that this species had been extirpated as a resident in the eastern Rainwater Basin in the 1930s, but since then prairie-chickens have colonized and persisted at isolated grassland tracts, including those on wetland conservation properties where trees and brush have been removed. Since 2005, leks have been established at Harvard WPA and Hultine North WPA, both in Clay Co, Prairie Dog WPA, Kearney Co, and near Rauscher WPA and Wilkins WPA, both in Fillmore Co; best count at these locations was 22 at Hultine North WPA in 2005 and 2008. In extreme southwest Fillmore Co, 15 were seen along Highway 74 on 9 Apr 2017. The first lek in York Co for many years was at Kirkpatrick Basin South WMA, with two males there 18 May 2007 and two on 12 May 2008. One bird at Marsh Duck WMA, York Co 13 Feb 2017 was the first sighting there, and there were further reports in 2017 at locations where breeding has not occurred: four were at Funk WPA, Phelps Co 10 Jul, and one was reported at Straightwater WMA, Seward Co 2 Jun; one was in the same area in 2018, near Tamora, Seward Co 14 Apr (Dubry-Garcia 2018). In the southeast, as of spring 2017, there are four disjunct areas in several southeastern counties where native grasslands persist or have been planted to grassland under the CRP (Mollhoff 2016): (1) Jefferson and southwestern Gage, (2) eastern Gage, Johnson, Pawnee, and Richardson, (3) southeast Butler and adjacent portions of Saunders and Lancaster, and (4) southwest Lancaster. The populations in these areas may represent the northern range extent of the larger populations present in the Kansas Flint Hills. Recent reports from Jefferson Co are few and include booming heard at Rock Glen WMA 8 May 2012. The center of the southeasternmost population is Pawnee Co, where numbers peaked at 41 on a long-standing booming ground at Burchard WMA 7-9 Apr 2017. In recent years small numbers have occurred in extreme southeast Butler Co; two leks with a total of 15+ birds were found 10 Apr 2010, and as many as 15 were on a lek at 25th and U Roads 10 Apr 2016 and 16 were there on 21 Mar 2017. There is a population at Audubon’s Spring Creek Prairie and neighboring private grasslands south of Denton, Lancaster Co: as many as 17 have been seen since 2000, those on 8 Oct 2002, and breeding was documented there in 2002, 2003, and 2010. The only recent report in the southeast away from these disjunct populations is of lek with four birds in southern Cass Co at the junction of Highways 50 and 34 on 13 Apr 2006. Although generally thought to undergo only local movements except on occasion in winter (Johnson et al 2011; see Winter), a recent telemetry study (Vogel et al 2015) found that a female that had been translocated from Chase Co, Nebraska to Grand River Grasslands, Ringgold Co, Iowa, subsequently travelled 3988 km into parts of four neighboring states 5 Apr 2013- 20 Jun 2014. The longest daily movements occurred in the spring periods during this period. It was suggested (Vogel et al (2015) that translocated birds move greater distances than local birds, probably due to unfavorable social interactions between lekking females and searching for mates at different lek sites. Lek activity: 7 Feb-20 Jun. Peak around 10 Apr. Eggs: 29 May-12 Jul (re-nesting?). Winter: This species has a propensity to move southeastward during severe winters, although as habitat has become fragmented throughout the range, this propensity has declined (Johnson et al 2011). In Nebraska, such movements have not been observed since winter 1983-1984, when there was an influx into Polk Co mid-Dec through 9 Jan, including a flock of 100 on the York-Polk Co line three miles from Benedict (Morris 1984). A large flock of 37 was at Mormon Island Crane Meadows, Hall Co 14 Feb 2018; this location is not far south of the nearest breeding locations in northwestern Hall Co and adjacent Buffalo Co and suggests at least occasional winter visits to the Crane Meadows. High counts: 500+ in Wheeler Co 3 Jan 2016, 174 on Beaver Valley CBC, Boone Co 16 Dec 2007, 173 on the North Platte CBC 22 Dec 2015, 150+ (in one flock) Boone Co 29 Dec 2018, and 135 (in one flock) near Brady, Lincoln Co 1 Jan 2017. Comments: The distribution of this species in Nebraska has changed over the past 150 years with the distribution of cropland in the state. It is not at all clear what the pre-settlement distribution of Greater Prairie-Chicken was in Nebraska, but judging from habitat requirements and early accounts from Iowa and Illinois (Bent 1932), it is likely the species was present in the mid- and tall-grass prairies of extreme eastern Nebraska. What is clear, however, is that as European settlement progressed westward beginning in the 1850s, and as croplands mixed with grasslands, Greater Prairie-Chicken numbers increased dramatically, a phenomenon experienced earlier and described by pioneers in Illinois and Iowa (Bent 1932). Two hunting parties based in Omaha shot 422 and 287 prairie-chickens 6 Sep 1865, and in 1874-1875 shipments of birds to markets in New York and Boston totaled at least 100,000 (Swenk 1936). It is likely that numbers in Nebraska peaked in the 1880s. Subsequently, numbers decreased as tallgrass prairie was almost completely converted to croplands. It has been suggested that the general increase in the Greater Prairie-chicken’s range and numbers in eastern Nebraska since the 1980s is a consequence of the increasingly mosaic nature of agricultural areas there as CRP fields and smaller farms such as “hobby” farms become more widespread, in effect mimicking (in the reverse direction) the mid-late 19th century era of westward expansion of small grain-growing farms into prairie areas (Thomas Labedz, pers. comm.). Two were in southeast Washington Co 26 Aug 2010 and one flushed from a Dodge Co cornfield 2 Apr 2010 was the observers’ first for the county. Since about 2004 there have been increasing observations of leks in row-crop fields rather than the usual grasslands in counties where there had been no recent reports of the species. Reports in 2004 were of a group of 10-15 males in a cornfield adjacent to grassland in Lincoln Co 17 Mar, 16 birds, including a female, in a central Fillmore Co cornfield with no nearby grasslands 24 May, and 30-35 birds in a wheat field planted to corn in Franklin Co 23 Mar; there was a report from northwest Nuckolls Co in 2007. Bent, A.C. 1932. Life histories of North American gallinaceous birds. Bulletin of the United State National Museum 162. Dover Publications Reprint 1963, New York, New York, USA. Dubry-Garcia, L. 2018. Greater Prairie-Chicken photos, Bird Nerds of Nebraska Facebook page, 14 April 2018. Morris, L. 1984. York Co. NBR 52: 23. Pyle, P. 2008. Identification Guide to North American Birds. Part II, Anatidae to Alcidae. Slate Creek Press, Bolinas, California USA. Rodgers, R.D., and RW. Hoffman. 2005. 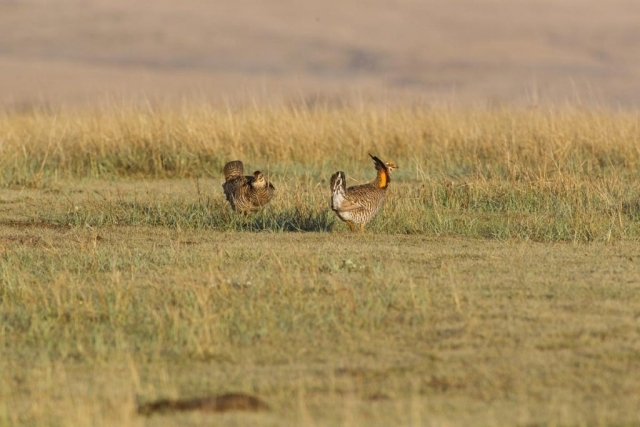 Prairie grouse response to Conservation Reserve Grasslands: an overview. The Conservation Reserve Program – Planting for the Future: Proceedings of a National Conference, ed. A.W. Allen and M.W. Vandever, 120-28. USGS, Biological Resources Division Scientific Investigation Report 2005-5145. Swenk, M.H. 1936. Editorial Page. NBR 4: 11-12. Vogel, J.A., S.E. Shepherd, and D.M. Debinski. 2015. 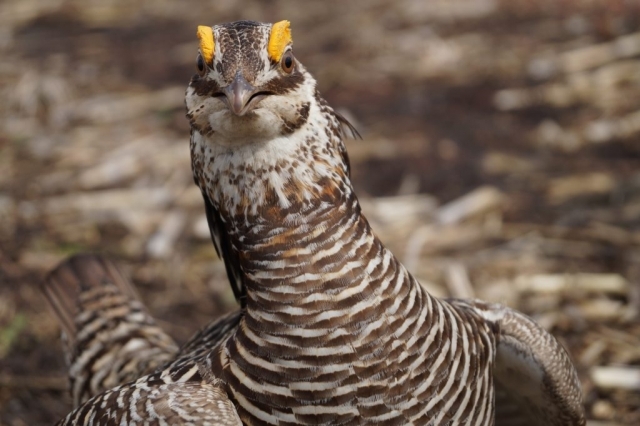 An Unexpected Journey: Greater Prairie-chicken Travels Nearly 4000 km after Translocation to Iowa. American Midland Naturalist 174: 343-349.